Imma tell you a story. Once upon a time I joined twitter and met Rugby and fell in love. I was faithful to the World Cup and then when it was over, started up with the Sevens World Series. And very quickly (because those games only last 14 min) I noticed Peter Tiberio. I mean we can talk about his talent, or anyone else that plays for the Eagles, all day - but I just like his style. It's dynamic. Awesomesauce. He became my favorite. 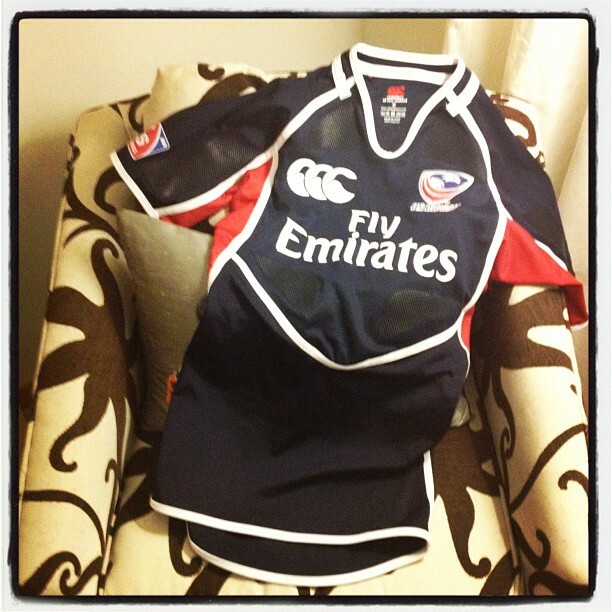 Since Twitter was supporting my rugby relationship I started following every USA player on there including Tiberio. I replied to a few of his tweets and he replied back a few times. Which totally made me geek out. In January Rugby Magazine named him as the College Sevens player of 2011. I tweeted this: "Feeling validated in how awesome I think Peter Tiberio is after seeing the list of Rugby Magazine 2011 award winners. And I did feel validated. I mean, here I am pretty new to the sport and I picked this dude as my favorite because I thought he was good. But in the grand scheme of things, what do I know? I should also mention that it's not like I get a lot of sports commentary here. I watch the sevens games through a (probably pirated) website at all hours of the night due to the games being all over the world. Who can really say what I pick up when I wake up at 3:15 to watch about 20 minutes of rugby. So yeah, I was pretty proud of myself that I managed to identify legit talent. Anyways - dude responded...which led to a little chat over Twitter that included Tiberio saying: "haha thank you! Maybe I can send you a jersey after next tour!" SAY WHAT?! I didn't even know how to respond. I have NEVER tweeted a message of support with the hopes of getting something in return. I just really appreciate Twitter in that it's a direct way to show some generally under appreciated players that there are people rooting for them. When I told him he was sending me into total geek out mode (I went with honesty because let's face it, I have no idea how to "play it cool") he responded "If I make next tour I'll send you one!". He also mentioned that if I was going to the tournament in Vegas, he'd give it to me in person. Which made me nearly consider buying tickets and booking a flight, but I really like the idea of saving that for my big 3-0 next year. Since I wasn't going to make Vegas, I let him know that I definitely accept gifts in jersey form and he said "deal". Side note: this all happened in early January. Back when I was just starting to realize how much of a sports fan I was because I have never in my life wanted or owned any kind of sports jersey. Because it was a while ago, I totally expected him to never remember. Which was fine - it was enough for me that he offered. Tiberio made the tour, as I knew he would. He played in Wellington and in Vegas scored two HUGE tries and amongst those in the know he was commonly mentioned as one of the top 3 stand out players. After he scored the final try in the France game I tweeted him just to be all "Yep you're awesome" (side note, it was worded better than that) and he responded saying that when he got back to California he'd have me send my address so he could mail me a jersey. Oh SNAP! This whole jersey thing was getting way real. Vegas ended on February 12 (another special day) and on February 14 Tiberio sent me a message saying "Send me your address if you still want that jersey." PSH. Still want it!? Let's hope he's not a stalker because I didn't even hesitate before sending my address. There are a million awesome things about this jersey. But the top 2 are: It's TINY. Well not really, they are made to be skin tight. Which means it fits me. Oh yeah, I totally plan on rocking this thing. I'm not currently wearing it, but I will be looking for any reason to wear it anywhere. The other top reason it rocks: It's like completely legit. You can't buy something like this. It has HIS NAME on it. If anyone asks where I got it, the ONLY answer is: "From Tiberio." Two of my favorite things. AKA Emma is a camera whore and would not let me put this jersey anywhere without sneaking her way into the shot. Haha - Dad I'd like to see you fit in it! It's a Medium and it's tight on me. I think someone had to help him get into that thing. 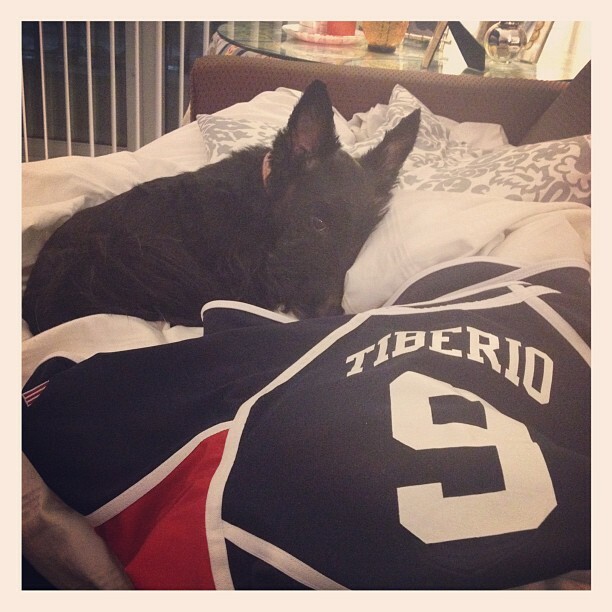 But yes, it looks like he's an alright guy, that Tiberio.